dbclunie: DIY Battery Pack For Ingress! DIY Battery Pack For Ingress! Over at adafruit industries you can find this little circuit kit to charge up whatever device you would like for a mere $19.50 (you have to supply the case which can be almost anything!). 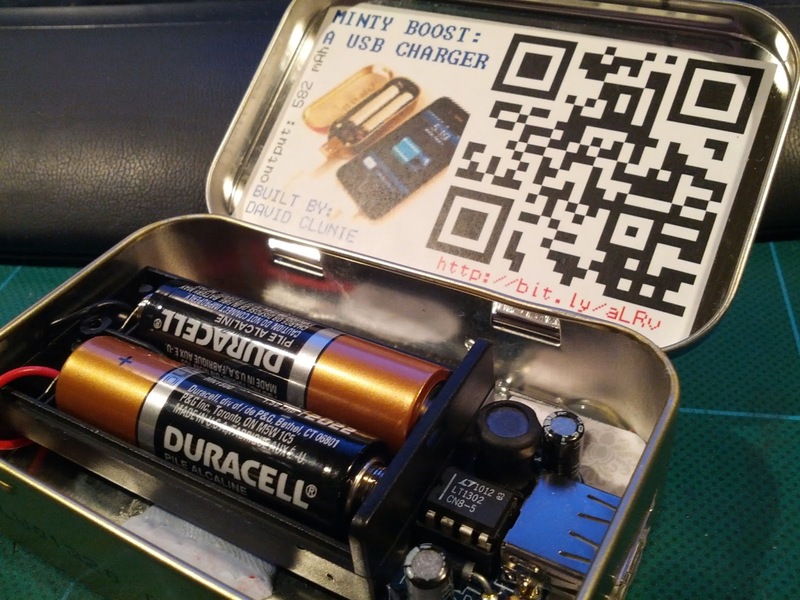 The device is called a "Minty Boost" after the tin is was initially designed around, a Altoids Mint Gum tin no bigger than the circuit and two AA batteries. With this you get 582mAh! You can also find mods to allow for a solar powered lipo battery version! 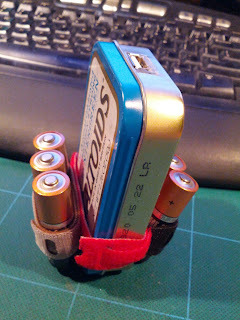 These are 2000-2500 mAh (depends on where you get them but I look for the 2350mAh ones) I made a quick battery bandoleer and can fit on 3 more charges! Woot! Initially I was going to use this kit in a dental floss container for super steath and a couple of AAA but the case was just too small. I then switched to this altoids tin and was still using a 3 AAA holder with spares stored on the sides of the battery holder, but that didn't seem to give the same bang for the buck, so to speak. I ended up with this current configuration though I'm thinking of using a three AA holder in place of the two AA holder. Right now you can see the blue tack putty in the bottom holding the batteries in and somewhat insulating the wires from the bottom of the tin. This is great for the ingress game from google. This kit offers up the viability of long sessions and the ability to customize or "hide" it to your liking for prying enemy eyes!